Can it be that someone born with the family name Prose is predestined to be a writer? Francine Prose --- successful author of 14 novels and four works of nonfiction plus several children's books, and teacher of writing at numerous colleges --- would seem to be a good argument for that idea. In this book she passes along tips gleaned from a lifetime of voracious reading and classroom discussion. The main body of her text consists of excerpts from books she has admired, followed by her brief on what makes them so riveting. Her chapter headings –-- Words, Sentences, Paragraphs, Narration, Character, Dialogue, Details, Gesture –-- sound alarmingly schoolmarmish and there is indeed a certain classroom-like air to the book. One can visualize her standing at the blackboard, chalk in hand, while her reader-students dutifully scribble notes. But there is more than that to this book. Prose has been there, done that, and from her writing and reading life she has distilled some important general principles that cannot be stressed too strongly. Most important of all, perhaps, is the simple love of books and reading in this age when the death of the book is widely accepted as inevitable. How do fine writers learn to write? By reading closely the works of other fine writers and saying "My God, why can't I learn to do that?" Allied to this is her dictum that pedantic "rules" for good writing are a waste of time. The best writers break them all the time. It is a very large element in their greatness. Her second Big Idea follows from her first: When you read, read closely, noticing how good writers achieve their effects --- by artful choice of the right word, subtle emphasis on apparently minor details, crafty shifts in tone and style, constant alert observation of the world around them. The evidence is there before you on the page, so pay attention to it. It would be easy to play the parlor game of critiquing the list of authors Prose uses as exemplars. A good number of them are people not likely to be familiar to a wide public. So why A, B and C and not X, Y and Z? (My own nitpick would be her scant attention to Dickens, the greatest writer of prose fiction in the English language, who is quoted just once and mentioned in passing three other times. There, I've done my critical duty, picked my nit). But this would, I think, be to miss a more important point: The excerpts she chooses all serve her purpose admirably. Another set of completely different passages could obviously accomplish the same thing –-- but the important point for the writer/reader is the lesson to be learned. A serious limitation of this useful book is its almost exclusive emphasis on fiction. Francine Prose has little or nothing to say about travel writing, memoir, criticism or any other form of nonfiction writing. At the end of her text there stands a truly daunting list of "Books to be Read Immediately" --- and of its 117 entries no more than half a dozen are nonfiction. That list also brings up a practical question: How is one supposed to read 117 books "immediately"? I have read maybe one tenth or so of those books; I fear that if I start conscientiously today on those that remain, my obituary will read "he made it up to no. 45." A word of advice: If you love books and reading, or if you are serious about your own writing, add no. 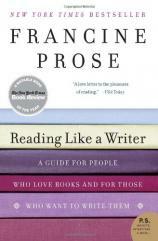 118 to Prose's list –-- this book.